• Top GTD Tournament : $50,000 Held Every Sunday. Bonus Type : You will automatically receive $10 in FREE CASH every time you generate 800 VIP points (80 VIP points for every $1). This process repeats until 150% of the deposit is met. • Top GTD Tournament : 750K Weekly GTD Tournament Held Every Sunday. Bonus Type : Play Through Bonus Each point is worth $.06, so you can earn up to $18 per hundred hands, Your bonus is released to your cash account in increments of 10% of your initial deposit. Full tilt Poker is no longer Trading. • Top GTD Tournament : 250k Monthly GTD Tournament plus 100k Weekly GTD Tournament. 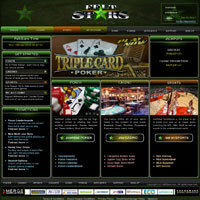 • Poker Welcome Bonus : 200% up to €1,000 welcome bonus. Bonus Type : Earn FPP Points playing raked hands or by entering tournaments your bonus is Paid in increments of 10 euros, players have 60 days to fulfill the bonus requirements.